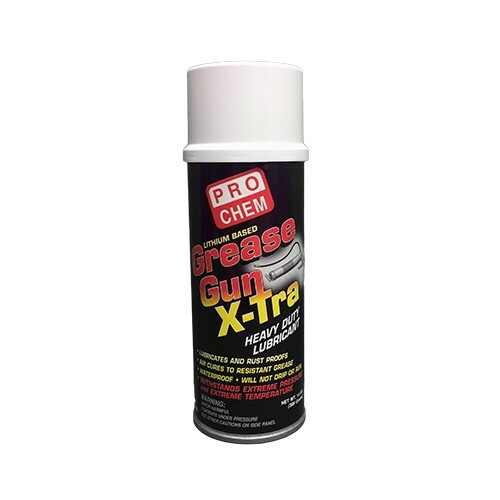 Grease Gun X-Tra | Pro Chem, Inc. GREASE GUN X-TRA is a premium grade, multipurpose, lithium-based red grease with superior performance in a wide range of industrial and automotive applications. It clings to vertical and overhead surfaces without dripping or running. This product is resistant to chemical breakdown, withstands extreme load pressures and has excellent temperature and viscosity stability from –60°F up to +500°F. It prevents water washout and withstands harsh chemical environments. It sprays as a liquid to flush off old contaminated lubricant, creeps deeply into working parts and then sets up to a viscous, thick grease that withstands acid, salt spray, and oxidation. Shake well before using. Apply 8-10 inches from surface, or use the plastic extension tube for hard to reach areas. Shake can occasionally during use to prevent clogging.